Indiana Crawlspace Waterproofing: Crawlspace Vents-Good or Bad? Thoughts, Ideas, and Comments, from a crawl space waterproofer. Including helpful tips and tools concerning Indiana crawl space waterproofing and repair. For many years in Indiana vents were thought to be one of the best ways to help reduce moisture levels in crawlspaces. Not to mention help reduce musty/moldy smells and aid in the speedy drying of a flooded crawlspace. So much so that vent installation is included in many building codes for new construction homes. But as time went on it started to become more and more clear that crawlspace vents just don't work, or at least not in Indiana. A homeowner will usually stick to a regular routine of opening vents around spring time and closing the vents around winter time. The problem begins to start when summer hits. Consider the type of summers we have in Indiana. Very hot, very humid summer days. The same very hot, very humid air that flows through your vents and into your crawlspace. Now consider the usually conditions most Indiana crawlspace consist of. Naturally cold because it is a hole in the ground. Naturally moist because of water vapor constantly escaping through the ground. So when this hot humid air mixes with this cool, damp air it creates not only more moisture but it also starts to cause many pipes and duct work to sweat, making your air conditioner work much harder than it really needs to. 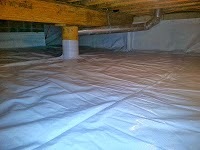 If the crawlspace has fiberglass insulation than the situation can become much worse. The insulation begins to start to work as a sponge, absorbing all this moisture. The insulation will than become very heavy and begin to fall. Vents can also increase the chance of heavy mold growth due to the various reason mentioned above. So this leaves us with really only one conclusion on whether vents are good or bad, and the answer would have to be bad.